You’re right. And that fact has never been on greater display than with the new BRZ tS. In the hierarchy of all things performance with Subaru, tS is a designation that signifies a model has been slightly upgraded compared to the standard model. It essentially means that a car has been “Tuned by STI”, hence the letters. I guess “TSTI” is too complicated. Anyway, next up would be a full-fledged STI version. followed by the the top-spec “s” variants, none of which we get here in America. For the BRZ tS, Subaru dove into the STI parts bin and plucked out a few great parts. The goal here is to ascribe to a notion that Subaru refers to as “handling delight.” The BRZ is certainly already that in its non tS getup. Fitted with Michelin Primacy rubber, it provides easy tail-happy fun despite an engine that only produces 205 horsepower. Some early reviews pegged the BRZ as being too tail happy in some situations, but I’ve personally never found that to be the case. (For whatever it’s worth, the rest of Team Jalopnik agrees with me on that point.) It’s slower speeds and smart chassis setup lead to a very communicative machine that lets you know when it’s about to break away. And when it does, it doesn’t happen too quickly. Your body feels the rear end overstep what the nose is doing, and your hands smoothly apply a bit of our old friend opposite lock. In your head, you’re the resident Drift King, and the action all unfolds at highly manageable speeds. Subaru wants to tighten this action up. So a number of changes have been employed to get the BRZ back in line, to turn it into the “handling delight” that Subaru believes it should be. To accomplish this, the engineers stiffened up the chassis and added far stickier tires. We now have a BRZ wearing a flexible draw stiffener that connects the body to the front sub frame. In addition to adding in some rigidity, this reduces any delay you’d find from the time you turn the steering wheel to when you then feel the front wheels turn that in-cabin action to actual action. There’s also a flexible V-bar in the engine, which finds pillow ball bushings at the end of each of the cowl bars. This is another area of increased stiffness, but the pillow ball bushings have some give to keep the ride from moving past sporty stiff into overly harsh. (I am looking at you, Ford Focus RS). Further helping out the dynamic ride quality is the set of Sachs dampers at each corner. This change is immediately clear as soon as you start pushing the BRZ tS with any gusto. Up front, the nose is stiffer by 15 percent while the rear has been stiffened up just 3 percent. It’s the 18 percent roll reduction and 15 percent reduction in pitching that captures your attention though. There’s less brake dive, less body roll through a corner, which means you have a BRZ that remains ironing board flat when properly hustled. Much like the Subaru WRX STI Type RA, the BRZ tS is a limited-edition special. Subaru is cranking out just 500 copies. They’ll be split up amongst their paint codes, with buyers able to choose between white, black, or blue. Out back there’s a massive STI-tagged wing that is two-position adjustable. At each corner you’ll find 18-inch wheels wearing the upgraded Michelin Pilot Sport 4S tires. It’s those tires that also help the car earn a cliché yet deserving “on-rails” designation. Despite their 215/40R18 size, they grip and they grip well. Which is where we run into our main problem with the BRZ tS. It now handles so well that you’re even more aware of just how slow this sports car really is. This isn’t a case of being jaded by horsepower, though I love it as much as the next person. Sure, we live in a golden age for those who love twist and grunt but I can absolutely enjoy a slow-car-fast machine. With the BRZ, you really have to wring its Boxer four-banger to get the momentum up. It feels wrong to criticize a vehicle where the engineers made a strong effort to improve its handling, but I never had a problem with the handling of the BRZ. Like many critics, my chief complaint has always been about the power. When wearing the JDM-spec Prius tires and devoid of the chassis stiffening bits, your standard BRZ is smile-inducing fun with low limits set to achieve that fun. 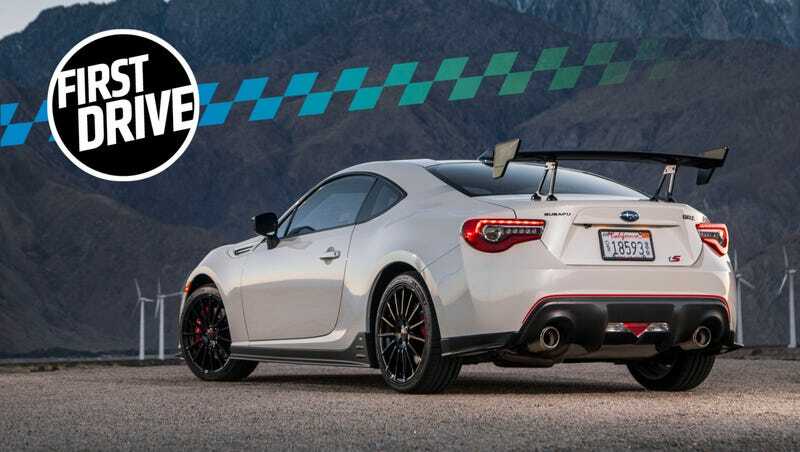 Once you add the admittedly great chassis tweaks, the better suspension damping, and the far stickier tires, you wind up with a BRZ crying out for at least 250-275 horsepower. Not 205 HP... at the crank. The tS shows us how great this platform can be, but now we need an STI version breathing through a turbocharger to give us the small two-door sports car we all really want. I mean, did we really need a BRZ with 18 percent roll reduction and 15 percent reduction in pitching? Is that what car enthusiasts everywhere were screaming out for? You know the answer to that and so do I. Another problem arises when you find out how much it costs to own a glaringly slow BRZ tS. The MSRP is $33,495. That’s a lot of dough for a BRZ that’s going to leave you wanting for more every time you decide to drive it aggressively. I know you’re screaming at your monitor right now wondering how the hell I could possibly give praise to the WRX STI Type RA earlier this week for seemingly the same changes and its own eye-opening price tag. That is because Subaru took the Type RA changes quite a bit farther, with the inclusion of that carbon roof, upgraded valves, and massive improvements to the overall handling performance. On the BRZ tS, it’s far more mild. Still, it is an improvement and Subaru claim the BRZ tS will attack a slalom course faster than a 2017 WRX STI. How much faster? We don’t know. On the track, however, it’s clear that the engineers put in the time to make sure they hit the “handling delight” benchmarks. Communicating with the steering wheel, I can tell the BRZ tS exactly what I want it to do. On the both the sweeping higher-speed turns and tighter radius corners of Thermal Club raceway, the response I get back is immediate and clear. Couples married for 30 years don’t communicate this well. This is a very easy vehicle to drive at speed… once you get up to speed. There’s more than enough time to make sure you’re on the right line because that next corner isn’t quite coming up as quickly as you might’ve thought. I overheard another journalist at the event describe the BRZ tS as “the safest track day car ever built.” The limited-car cool factor is certainly appealing, and I don’t think Subaru will have trouble shipping off 500 of these. Ultimately though, it just leaves me wistful for a BRZ that doesn’t exist. We have a car that’s clearly better than the standard version. It’s not as fun though, and when you’re spending 34 large, more fun should be a standard feature.